Modern workplaces are made of much more than cubicles, bricks, and mortar. In this digital world where teams and business partnerships aren’t always composed of players in the same city, state, or even country, connectivity and collaboration reign supreme. Video is a powerful medium that satisfies those evolving needs, changing everything from how consumers shop to how teams—like our 30-strong tribe, all of whom work remotely—operate. How has the technology behind top-notch video tools changed to become as portable, seamless, and secure as they are today, and what videoconferencing trends can you expect to see in 2017? Let’s explore. Videoconferencing isn’t new. In fact, large, hardware-filled boardroom video systems have been used for decades. Over time, these systems relied less on telephone lines, cameras, and switchboards and more on robust network connections, VoIP audio, encoding—you get the picture. Whenever it’s employed, video helps remotely-located teams stay connected and work efficiently regardless of geography. It also aids businesses by lowering costs during the hiring process (less travel) and improving employee retention. Those benefits still apply today. However, enterprise videoconferencing looks a bit—ok, a lot—different than it did just a few short years ago. While some large firms do still opt for connected conference rooms full of telepresence hardware, in many cases, that strategy has been scaled back to include budget for hybrid videoconferencing options and smaller video collaboration spaces like huddle rooms. Part of the beauty of today’s videoconferencing landscape, though, is not every meeting requires a physical room (large group or huddle sized) at all. While those traditional video applications do still have their place in some environments, the future—and, especially if you’re asking Millennials, the present—favors flexible and often portable solutions. Thanks to the accessibility of cloud videoconferencing, for example, teams can participate in high-quality video chats anywhere and on any device. We all know collaboration means more than just talking to one another, though—that’s where collaborative platforms that incorporate video as a tool come into play. Let’s dive deeper into this trend—and others—you need to be watching for this year. Optimal collaboration is the goal, and video is but one in a suite of tools teams use to reach it. While videoconferencing can be powerful on its own, it’s made more functional when additional capabilities are built in. Take Cisco Spark, for example—a cloud application that connects team messaging, phone calls, file sharing, video chats, and more. This “one-stop-shop” type of cloud-based collaboration is the future. Skype might be challenged by free video conferencing services. Skype has traditionally been many users’ go-to choice for quick, free videoconferencing on personal devices. In 2017, look for Skype to be challenged by Facebook Messenger, Google Hangouts, UberConference, and plenty more vying for a place in that corner of the market. 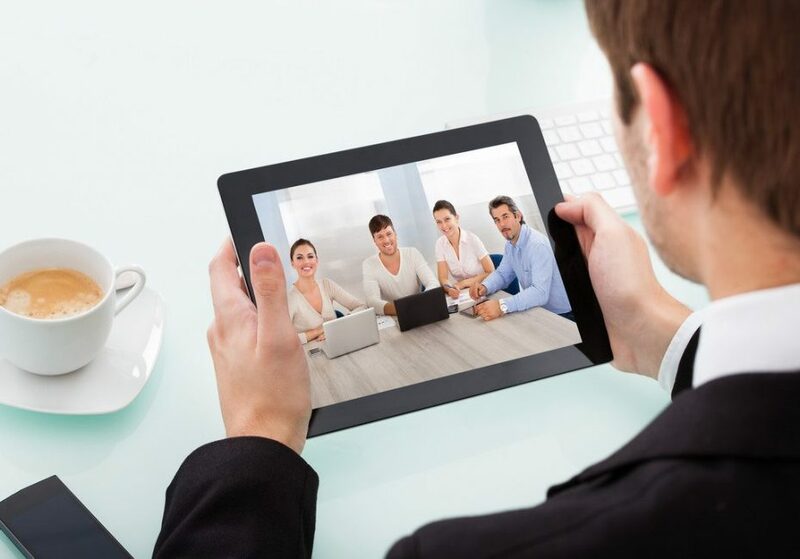 Mobile video conferencing will go as mainstream for business as it has for personal use. According to Gartner, more than 90 percent of all videoconferencing today is attributed to endpoints within the same organization. Still, analyst Robert Mason projects “Additional portability is available for the most-demanding executives, who can elect to participate from home with personal telepresence systems. Front-facing cameras, fourth-generation (4G) networks and the continuing emergence of new form factors, including video-capable tablets, will also reinvigorate interest in mobile videoconferencing.” I agree. Video goes beyond the boardroom. Look for video tools to shine in other markets, even incorporating virtual reality (VR) into the mix. Video ATMs are becoming popular, for instance, in the finance industry, as are telehealth visits in medicine. Video will also explode even further into the education market in 2017, continuing to reshape how (and from where) students learn. Less email, more video in the workplace. Email is a powerful tool for marketers, but what about as a means for employees to communicate with one another? It turns out email’s glory days might be over—sort of. As workplace tech takes off, the anytime, anywhere nature of video gives users an immediacy and personal touch email can often lack. The transition won’t be a swift one because many of us are so used to utilizing email as part of our daily lives, but it is coming. I recently covered our team’s positive experience using Cisco Spark, a platform that incorporates the power of video along with other collaboration-boosting capabilities. (Read: Cisco Spark: A Collaboration Platform That Puts the ‘Transformation’ in ‘Digital Transformation.’) What works for you? How do you use video in your business? What trends do you think you’ll see in 2017—and how do you plan to get out in front of them? Tell me in the comments.